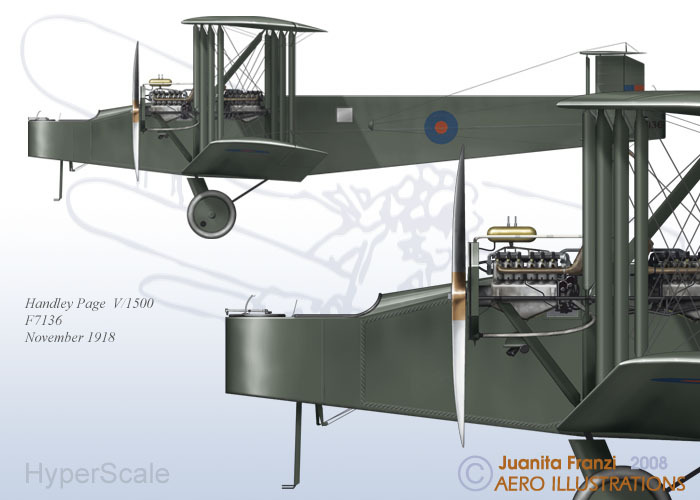 Here is my artwork of a Handley Page V/1500, F7136. The V/1500 was the largest of the British bombers of WW1 and its design was based on that of the O/400. It didn’t enter service until late in the war and did not complete any missions before the war’s end. It was, however, used in the Afghan theatre in 1919. This particular aircraft, F7136, undertook a record flight when it flew with 40 passengers, including several women, on a ½ hour flight over London in November 1918.